1 What is the Mentor Program? 3 How do I request a Mentor? 4 I want to help! How do I become a Mentor? 5 Why would I want to be a Mentor? 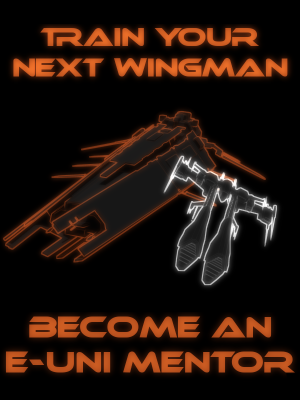 Mentors are volunteers, who want to give back to EVE University by helping new players get off to a good start in EVE. They are experienced players who have been selected based on their qualifications and ability. Mentors assist their assigned charges through EVE mail exchanges, online chats, Mumble discussions, or in-game exercises where appropriate. Once begun, mentorships last for a period of three months, unless extended by mutual agreement of both the Mentor and their mentee. Request a Mentor - we can help! Whilst ideally we would like to be able to give everyone a mentor who wanted one, due to limited mentor availability this is unfortunately not feasible. Formal mentorships are, therefore, not usually intended for players already well-experienced with the game (eg. more than 4 months active playtime) or experienced players wishing to specialise in a particular area of the game. If you feel you fit in this category, it is suggested that you join a campus that suits your particular interest and/or find someone who can mentor you on an informal basis. 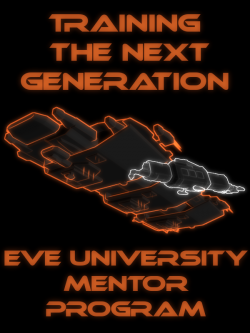 The mentor program is restricted EVE University members in good standing and you must be a full member of the UNI when you apply for a Mentor. Please note that if you drop from the UNI later for wartime or other purposes, you may continue to interact with your mentor while you are out of corp (if you mutually decide to do so) but the official mentorship will end. If you meet this criteria and think you fit in with the guidelines above, please follow this link and fill out the web form. The Mentor Program staff will review your application and put you in touch with a suitable Mentor. Ultimately all decisions will be made on a case-by-case basis, so if you feel like you could benefit from having a mentor, don't be afraid to apply! Please be aware that current high demand means that you may wait 1-2 weeks for a good match. In the meantime, please get involved with one of the Uni campus groups and don't lose heart! If you have any questions about the program or any issues with a current mentorship, please send an EVE mail to the Mentor Manager or one of the Assistant Managers and we'll do the best we can to help. I want to help! How do I become a Mentor? E-UNI Graduate title, or E-UNI Sophomore title with comparable demonstrated prior experience in EVE and in the UNI. An understanding of the essential mechanics and fundamentals of EVE - you don't have to be an absolute expert, but we do expect Mentors to know about the basics of skill training, ship fitting, missioning, trading, mining, hauling, exploration, fleet operations, accessing UNI resources, and complying with UNI policies, as well as how to use essential EVE tools such as EveMon and Pyfa. To apply to be a Mentor, please follow this link and fill out the web form. You should receive a response within a week. Most importantly, working with other EVE players who are eager to learn from your experience is FUN!